Needless to say, nobody really wanted to finish that ketchup. Nor could any of us be convinced that three spears of mushy canned asparagus, a crusty corner of rubbery lasagna, and half a pork chop of questionable age constituted a decent meal. Yet such were the offerings on a typical leftover night; we ate what there was to eat and then admired the clear, white space we’d created inside our refrigerator. Of course, if you live with a man whose sense of humor is about as sophisticated as an eighth-grader’s, you’ve probably learned not to serve balls for dinner. It’s a good policy, especially considering that patties are easier to deal with than balls. Okay fine, let’s all take a moment to snicker. There. Now in the case of suppli di riso, which is basically breaded, pan-fried risotto, patties have two advantages over, um, spheres. They’re easier to form around a bit of cheese and easier to cook since all you have to do is flip them. Either way, they end up being delicious — crisp on the outside with all the cheesy creamy goodness of risotto on the inside. In fact, we like them so much that I routinely make extra risotto just so we have some left over. And that’s saying a lot. 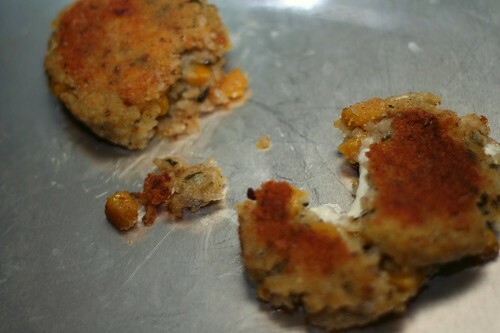 1) Form the risotto into six patties, placing a slice of cheese in the center of each. I make a thin patty, top it with cheese and another thin patty, then round the whole thing out by cupping my hands around it. 2) Beat the egg in a shallow bowl and pour the breadcrumbs into another. Dip each patty in egg, then breadcrumbs to coat. 3) Heat the oil in a large skillet over medium-high heat. 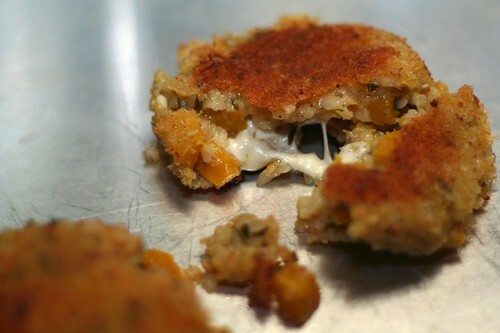 Fry the risotto cakes for 2-3 minutes on each side. Remove with a slotted spoon and drain on paper towels before serving. They’re nice with a fresh green salad. This entry was posted on March 1, 2009 by Megan @ When Harry Met Salad. 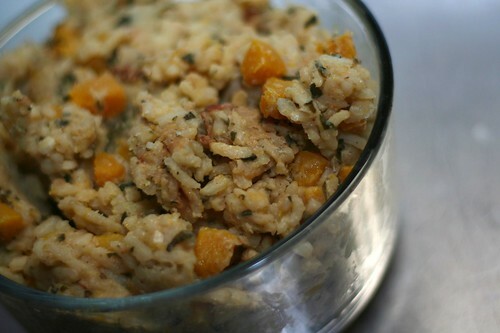 It was filed under rice & other grains and was tagged with leftover risotto, mozzarella, risotto, risotto cakes. Those look freaking delicious, especially the first pic with the cheese oozing out! I make something like these, like you said, on the rare occasion we have leftover risotto. Only I’ve always called them aroncini. And yes, my twelve year-old insists on calling them balls. What ever, as long as he eats them. I know you’re veggie, but suppli with chicken livers are damn good! Hmmm… I wonder if that would work with falafel (putting the cheese in the center) cakes too. I just tried them for the first time last night. I think the risotto will be easier. What is this “leftover risotto” of which you speak? Southern Belle, Kevin, & Grant – Thanks! Kirby – Right, twelve is exactly that level of humor. Lu – Um, livers? No. Just no. Kristi – I’ve never had falafel (crazy, I know) so I’m not sure. It seems like physically it would work, but I have no idea how it would taste. Assuming falafel is yummy with cheese, go for it. Vikki – I know. I make extra on purpose. Meaghan – You could totally make these! Really. . .it’s easy. AMAZING website! Can’t wait for the next recipe! And what kind of camera do you use? Your photos are great!